The Sun and Moon are the two celestial timekeepers that can be observed to measure time, dates and the seasons. The rising and setting of the Sun marks the day and night. The waxing and waning of the Moon indicates the progression of the months. The 7 days of the week are named after the 7 prominent celestial bodies that are observed in the sky. The Sun, the Moon and the 5 visible planets, Mercury, Venus, Mars, Jupiter and Saturn, have days of the week named after them. English names for the 7 days of the week originated from Roman and Anglo-Saxon celestial gods. Sunday is named after the Sun. Monday the Moon. Tuesday was named after the god of Mars, Tiw, by the Anglo-Saxons. Mercury which is referred to by astrology as the planet of communication, was associated with Woden, god of poetry. Thus Woden day became Wednesday. The god of Jupiter was Thor, Thursday. Freya was the god associated with Venus, so Friday. Saturday is named after Saturn. The system by which we measure time today was founded 4,000 years ago in Babylon. Timekeeping was devised by identifying and measuring the movement of the Sun and Moon across the Zodiac constellations. Ancient priests of astrology and astronomy devised a 360 degree system that plots and times the course of the Sun in a year. The coordinate system can be easily divided by 60, 30 and 15. A minute has 60 seconds. An hour 60 minutes. One day of 24 hours divided by 2 is 12. Due to study at the ancient university of astrology, scholars developed astronomy, the calendar and mathematics. Apkallus, a Babylonian god, revealed time, astrology and astronomy to civilization. Many religions have an association with time and the sky. The Gregorian Calendar is the everyday calendar we use today. In 1582, Pope Gregorian XIII abolished the inaccurate Julian Calendar which Europe had used since the time of Julius Caesar. The Gregorian calendar is an accurate time and date measuring system that keeps in sync with the annual course of the Sun. The astrology calendar is over 2000 years old. Because it has never been updated, it is out of sync with the sky and the everyday calendar. Discover how the astrology calendar became inaccurate. Scholars show Pope Gregory XIII a chart of the Sun against the Zodiac to indicate the location of the Sun throughout a year. The period the Earth takes to complete a rotation is 24 hours. Navigation (longitude) and celestial coordinates (RA right ascension) use a 24 hour and minute system to measure distance. Using degrees, instead of hours, is also applicable. By watching the Sun and stars move across the sky, you actually watch the Earth rotate. The stars move towards the west one minute in distance, every minute. Or one degree every 4 minutes. In an hour, the Sun and stars move 15 degrees. The Sun and stars rise in the east and set in the west because the Earth rotates eastwards. One hour time = Earth rotation of 15 degrees, or one hour of RA, right ascension. Four minutes time = Earth rotation of 1 degree, or 4 minutes of RA, right ascension. The seasons occur due to the tilt of the Earth's axis of 23.5 degrees of arc to its orbital plane. The direct exposure of the Sun's rays onto the Northern and Southern hemispheres alternates as the Earth revolves during its yearly orbit. So when summer occurs in Europe in June, the opposite season of winter occurs in Australia. Winter time for Europe is December, when Australia has long summer days. More hours of sunlight occur during summer as the Sun travels a high, longer path across the sky. Shorter days occur in winter as the Sun travels a shorter path closer to the horizon. More direct sunlight due to the angle of the Earth in summer. The angle of the hemisphere having a winter season is less direct, so shorter daylight hours. The chart below indicates how people living in opposite hemispheres observe the ecliptic path of the Sun move across different horizons. The chart also indicates that the declination of the daytime ecliptic at noon, is opposite to the midnight ecliptic path. Refer to the chart to compare the difference between the ecliptic path across the sky at midday and midnight in the Northern and Southern hemisphere. At midnight, 12 AM, the arc of the ecliptic is opposite to its midday, 12 PM course. The path of the ecliptic has a seasonal pattern. At midday in summer, the Sun travels a high arc (high declination) across the sky. At midnight in summer, the ecliptic path is low and close to the horizon. In winter, the passage that the sun travels across the sky is low, close to the horizon. 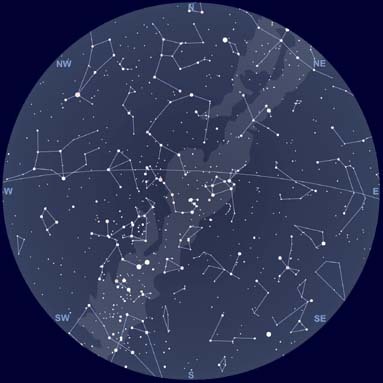 In winter at midnight, the ecliptic path is high overhead, as it would be during midday in summer. People living in the Southern hemisphere observe the Sun to rise from the East and move across the Northern horizon to set in the West. In the Northern Hemisphere, the Sun moves across the Southern horizon to set in the West. Traveler's who visit an unfamiliar hemisphere sometimes confuse North and South, if they refer to the Sun to get their bearings. By referring to the charts on an Astroplot, the seasonal course of the ecliptic, its rise and set bearing, can be plotted over a 24 hour period for each month of the year. 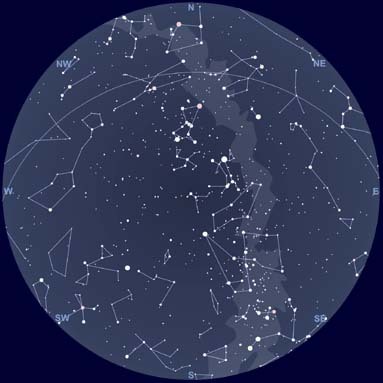 Refer to the Astroplot, using the 'Clock Process' to identify the location of the stars in the sky for any time and date.